Father Comes Home From The Wars opened at the Goodman Theatre in what can only be categorized as a seismic explosion of a production, excellent on all fronts. 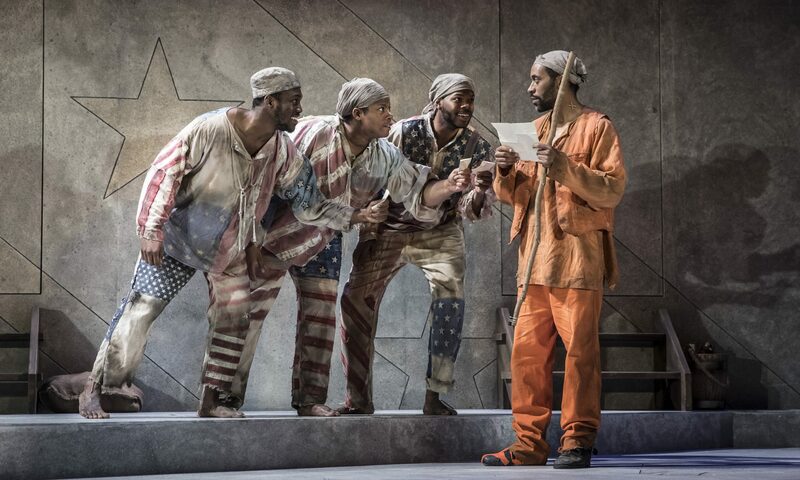 Under the persuasively specific direction of Niegel Smith, Suzan-Lori Parks’ three-part black civil war saga spilled over the audience like the heightened spirits of our ancestors that loom at our backs to remind us of the past and question our future. It is inspired undoubtedly by the great Greek dramas of the past, with character names like Homer (who is given a fiery portrayal by Jaime Lincoln Smith), Oddsee (Odyssey Dog) and Penny (Penelope). The central question of the three part play is What is Freedom? Who can attain it? And is Freedom even enough after the poison of white supremacy and systemic oppression, have guided, controlled, and infiltrated every area of our lives? Parks struggles with the predicament of the colonized mind by setting this epic during the Civil War. The main character Hero, aptly named for his journey, wants to escape slavery and sees an opportunity to do so by accompanying his master to war. The problem is, he’d be fighting for the Confederacy. Hero’s moral dilemma launches the audience on a journey of self-reflection and invites us to ponder who and what we’d sacrifice for our own freedom. Hero, played by Kamal Angelo Bolden, gives what can only be called a Tour de force performance as he decides whether or not to follow his Boss Master the colonel into the Confederate Army, having been promised his freedom in return. “The Chorus of Less Than Desirable Slaves,” on the plantation who try to help Hero make his choice are Leader (Jacqueline Williams), the oldest old man (Ernest Perry, Jr.), Second, (Sydney Charles), Third (Ron Conner), and Fourth (Michael Pogue). Each ensemble member deserves to be listed for their spectacular performance and their part in setting up the world and style of the play we are about to see. Linda Cho’s elegant costuming is simple yet instructive as patterns literally tell us who onstage is cut from which cloth. The play opens with Leader giving Second a hilariously long tirade demonstrating the breath control of a classically skilled actor and letting us know just how vast the journey is that we’re going to embark upon. Sydney Charles presents male as Second, and interesting directorial choice that establishes her as a versatile performer and Chicago staple. In part 1, “The Measure of a Man” we are made aware that Hero has committed a grevious betrayal, and in a staging that is totally unique to black greek culture and african roots, the chorus began stepping choreography that shows the extent of the betrayal. Each person has their own rhythm, fitting into a whole, from which Hero is painfully excluded. It is one of several glimpses we get throughout the night, that this production is told through our unique black lens and resonates for us deeply and personally. It is the direction of Niegel Smith that gives this play its vulnerability and its dignity. Through a use of gesture he lets us see the unspoken language that we imagine slaves may have had as they navigated a world where they could not always speak their mind. This language of gesture reappears through a more starkly structured Greek chorus of runaway slaves consisting of Tyrone Phillips, Nicole Michelle Haskins, and Bernard Gilbert. Haskins and Phillips are stars to watch that have been seen all over Chicago, and Gilbert recently had a formidable turn in Northlight Theatre’s Skeleton Crew. Honorable mention also goes to BrittneyLove Smith’s hilarious and heartwarming portrayal of Odyssey Dog, her specific physical choices and Cho’s costuming indicate a dog without taking away the dignity of the actor. It is rare that we see a production with so many fine Black actors of all ages. There is one choice to have a Black character portrayed by a white man which, though it’s requested by the playwright, ultimately made that piece of the narrative disingenuous for this writer (Regina Victor). Otherwise, the casting of this production creates hope for the future of Black artists in Chicago, and acknowledges the legacy of fine work that has been done before we were even a thought. This production of Father Comes Home From the Wars is an ambitious and stunning piece of our legacy, and you should not miss it. BIAS ALERT: We Black, so we know alladem.